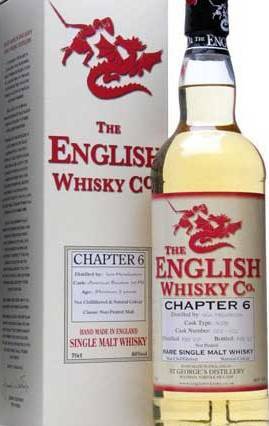 The English Whisky Co is, you guessed it, an English whisky company! It produces quite young whiskies and releases them in “chapters”. I had the opportunity to blind taste chapter 6 (unpeated) and, frankly, I was not impressed. It tasted like a grain or wheat vodka on the palate, and pierced my nose with alcohol – do yourself a favour and (in my opinion) give Grey Goose Vodka a try! I am not impressed with this whisky, it lacks complexity and does not have an enjoyable finish. I gave it an extra star because it has a pretty interesting nose! This whisky is a very light straw color almost like a diluted white wine. The nose is very sharp with bursts of acidity, and a musty smell wafts in the air similar to apple cider vinegar. Dried apple develops on the nose, with a sweetness intertwined with the dryness of chardonnay and the acidity of apple cider vinegar. Notes of apple pieces are also noticeable; green apple like a granny smith apple. On the palate this whisky has a strong delivery with an explosion akin to a wheat vodka with some apple. This is a very young whisky. It is quite alcoholic, with some bitter punch and harsh on the palate. It is harsh and grainy on the palate, leaving what I would describe as an unsavoury taste. The finish lasts for a while, but it leaves a bitter, almost medicinal, flavour on the tongue that I do not particularly enjoy. The alcohol is still noticeable, still conjuring memories of a wheat vodka I chugged down on a tasting at duty free (Grey Goose, for example!). To appreciate this whisky, be sure to try it alongside some other white spirits like vodka. It has a lovely nose but I think it collapses in a nervous heap on the taste and finish. This entry was posted in English Whisky. Bookmark the permalink.